Fall is my favorite time of year for hiking. The annoying bugs are thankfully dead and the cool temperatures make working hard a pleasure. Aside from the slippery leaves on the way down, Fall is a great time to hike in the Adirondacks. 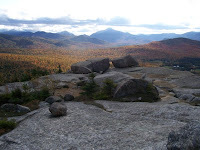 Pitchoff Mountain, accessible from Route 73 in Lake Placid, is a great hike. It is short and steep with awesome views of the High Peaks and the Bobsled/Luge run from the top. The upcoming long weekend is supposed to be perfect for Adirondack hiking. Although, my friends in the tourism industry tell me it is one of the biggest weekends of the year for visitors since it is Canadian Thanksgiving and Columbus weekend in the United States. So, if you plan to visit and hike in the Adirondacks this weekend, start early!